I love my dining table. Like LOVE it. It’s an Eye-talian made table that I bought at O.P. Jenkins after our house fire. (I can’t find any more specific information than that). This is one place I decided not to skimp. I’m all about a Goodwill rehab project but I wanted a good, sturdy table. 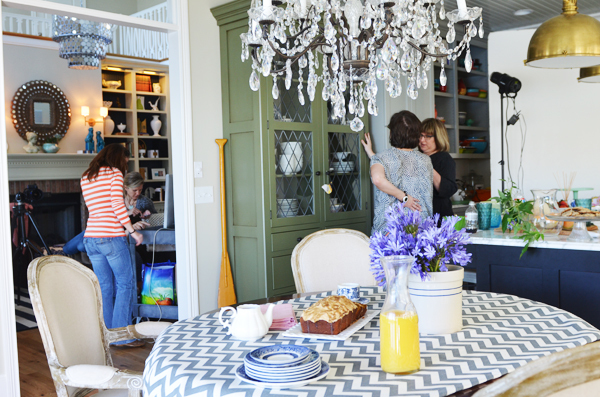 After seeing Julie’s beautiful table, I knew wanted a large round table that would foster all kinds of warm and cozy hospitality. I’ve tried various swatches of fabrics draped over it to simulate a make shift table cloth but I’m kinda rebellious. Far be it from me to go buy a table cloth to fit the table. THAT is way too right inside the box. When Better Homes and Gardens came to our house, I found a kindred spirit in Elizabeth because not only did she not care that I didn’t have a proper tablecloth, she swore she wouldn’t have used it anyway. And then she proceeded to duct tape a piece of fabric together and call it a day. We were obviously separated at birth. Then, before Thanksgiving, I hemmed and hawed around and nearly ordered a skirted tablecloth from Ballards. But it was gonna be $250 for the size of my table and that just seemed OUTrageous. So, I got my lazy sewing skills on and made one and I HAVE LOVED every raveling thing about IT. I mean, LOVED it. It’s imperfect and unfinished and raveling and beautiful. I wash it every Friday and then drape it back over the table while it’s damp to finish drying it. 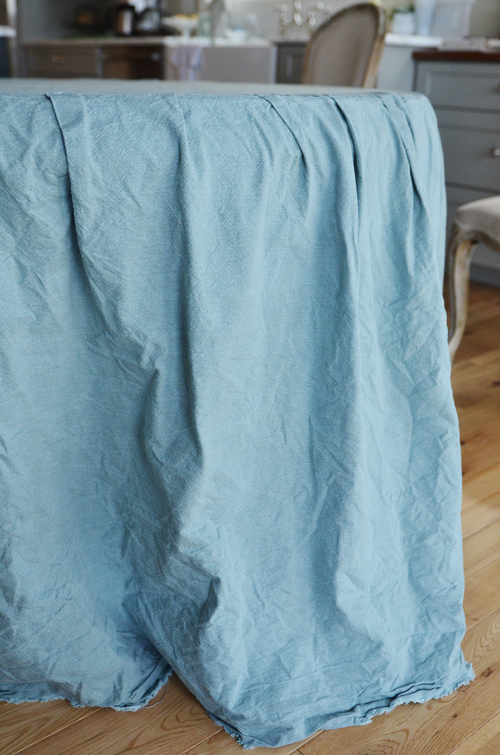 The first one I made was this perfect blue-green linen from Hobby Lobby. It’s the one we use all the time. Here is it, freshly laundered in all its imperfection. It adds just the right amount of coziness to my industrial/cottage kitchen. I could have ironed it. But then those 20 minutes of my life are gone forever. And we’ve got episodes of Gold Rush to catch up on, people. I made another one this weekend in anticipation of an upcoming soiree at my house. So, here’s the laziest tutorial ever known to man. 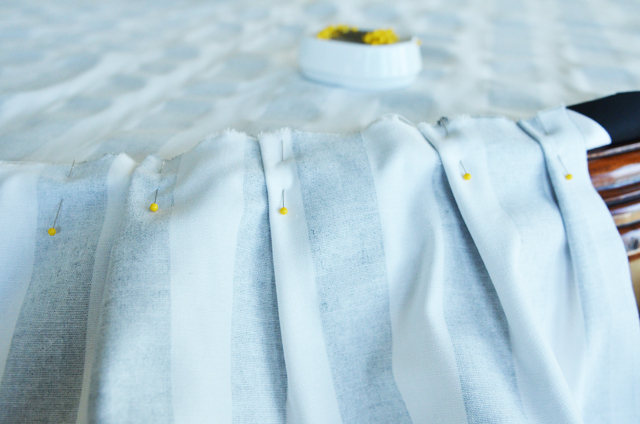 This tutorial will make real seamstresses shudder. I will do violence to the craft of sewing. I’m just giving you fair warning. First, lay the fabric on the table and roughly (I told you there would be violence) cut out a circle in the shape of your table leaving about an inch overhang. It helps SO much if you buy fabric that’s wide enough to cover the table. My table is 48 inches in diameter so I made sure my fabric was 54 inches wide. It makes this step so much easier. I sat some heavy objects on the table to keep the fabric from moving and then just starting cutting my circle. Okay, apparently, I sat a vase of flowers on the table but heavy objects would work fine. THen measure the drop of the table from top to bottom and add 3-4 inches to make sure it gently brushes the ground after it’s sewn together. 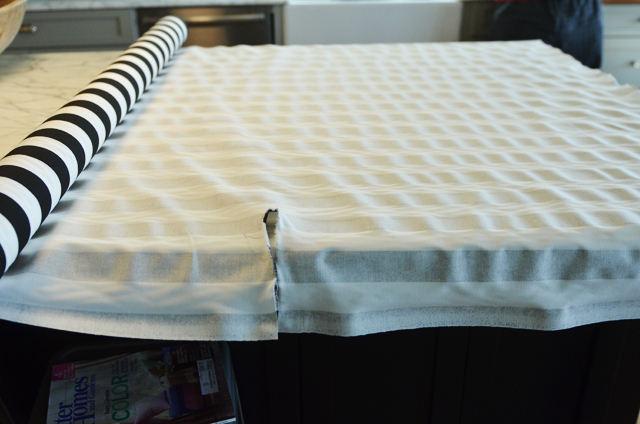 I just layed my fabric right on the island and used the tearing method to ‘cut’ my strips. Many fabrics won’t tear and honestly it’s harder to sew if you do that because of the raveling. But I’m like the ten year old who won’t listen. So I tore it into strips. And then cursed it while I sewed. It took 4 1/2 strips of fabric for me but it’ll depend on the diameter of your table. THen, I turned the circle piece wrong side up and started pinning the strips to the circle. 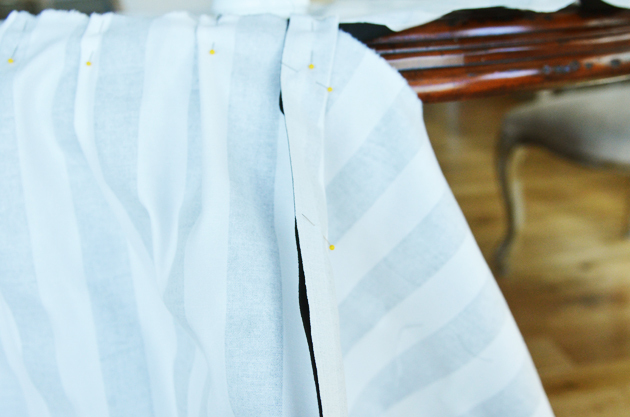 I added in some very imperfect pleats, just by pinning them in place. You can join the sides of each strip together if you want or not. I sewed all the sides together so my tablecloth skirt would be one continuous piece of fabric. Just pin it along the sides, when you’re joining the strips together. About halfway around the table, I took it up to the sewing room and sewed what I had pinned because, 1) The fabric gets bulky and heavy fast and it’s easier to deal with 230 straight pins than 500, at a time. 2) I’m terribly impatient and wanted to see what it would look like half way through. Ten, finish pinning the strips to the circle and the sides of the strips together until it looks like this. Now, sew the rest of the pinned pieces together and you will be so darn proud of yourself. Unless you’re me and do violence to your sewing machine by sewing at the speed of lightning on steroids and break the bobbin thread every five minutes and poke 8,00o tiny holes in your fingers. I have a love/hate relationship with my sewing machine but I do dearly love the finished product. I don’t hem the ends, just let the ravel-y goodness drag the ground. Surely that doesn’t surprise you. I made this for a fun silhouette/french themed party at my house next week. We’re making all kinds of goodies, of the crafty and food variety but this one is my favorite so far. My sincere apologies to all talented seamstresses in the world! Oh! Edie-I love it!!!!!! This is the best tutorial ever!!!!! I love your approach to this process. A bit whimsical and a whole lot of just going along and loving the finished product. It just breaks my heart that I can’t join this French inspired soiree. That you let the ravel-y goodness go inspires me! I kept picturing my high school home economics teacher, Miss Zwiebomber, with her eyes rolling back in her head as I read your tutorial this morning. I’m sure she wouldn’t have been able to survive your sewing sins! My favorite line of the month, possibly the year: “I will do violence to the craft of sewing.” Loved your tutorial. This kind of sewing I can do- I think! this tutorial is the most fun… and i have learned that the right way is not always the best way! yeah, let’s not tell her. i can’t have bona-fide home ec teachers stalking my bad tutorials!! Edie, I’m just gone keep it real here. I’m quite bothered by the unfinished edges. I’m not sure what that says about me, because I like you a lot, and you and everybody else on here seems fine with it. I don’t know why you even had to point that out, I would have never known. You could have pretended that you hemmed it, couldn’t you? Like you pretended on the pillow sham. I’m just all tore up about this hem! I don’t know, I just need perfection from my bloggers, and you’re ruining it for me. Girl, it’s killing me too! 🙂 But, I love Edie and want to try and let go of that ole perfectionism. Actually it doesn’t really bother me that “she” didn’t hem. I know that I would just “need” to hem it. Ha! It looks fabulous and I love the fabric. It speaks of “Joie de vivre”. 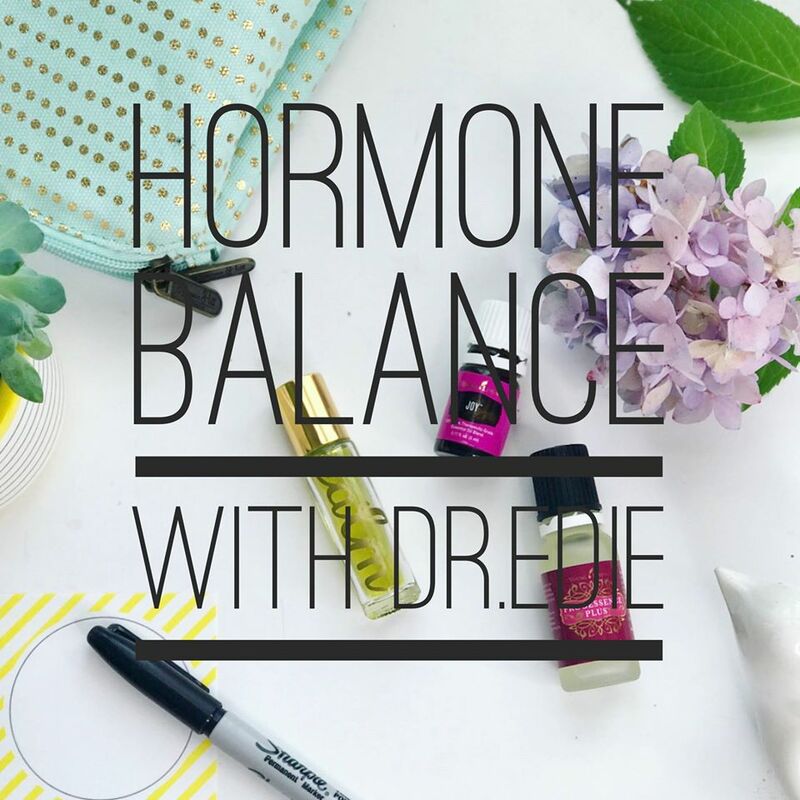 We all need some of that! I love the outcome as well! …..but as a pretty good seamstress those edges got me too! Love you Edie! we can all just pretend this post never existed. haha!! You are s much fun. Very French looking, very elegant-casual, whimsical. I love it. Ironed is nice, but this is even nicer, especially with those loose pleats. xoxo Think I’ll just try it. LOVE! So glad you showed this. I’ve been hemming and hawing about making one for FOUR YEARS! I can do this, and I most certainly will. I love it. Great tutorial. Your speaking my language. I was with you for a while and then I think the cold meds kicked in. 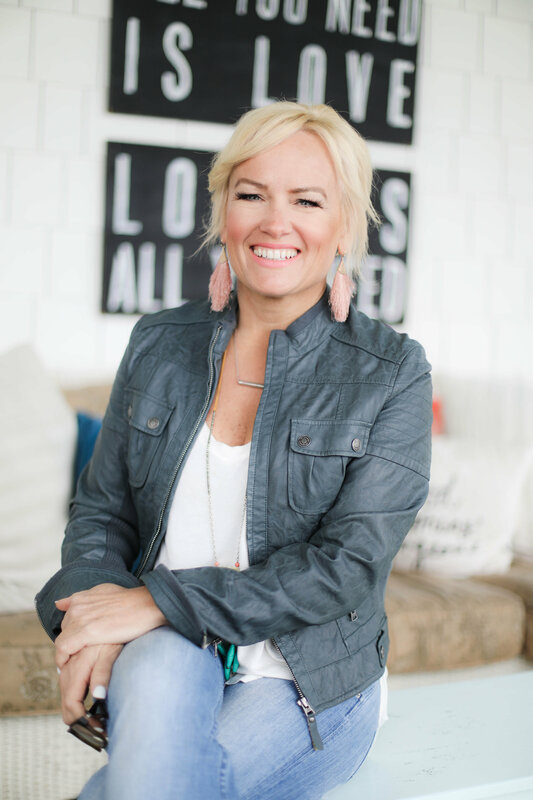 Can I just say I’m giddy about the fact that BHG uses duct tape, too! i was relieved about the duct tape too!! I don’t recall enjoying a sewing tutorial more than this one, eveh! I laughed and I thought to myself “It really is far more fun to try or do without worrying about perfection!” Love it! Thanks for sharing with us!! 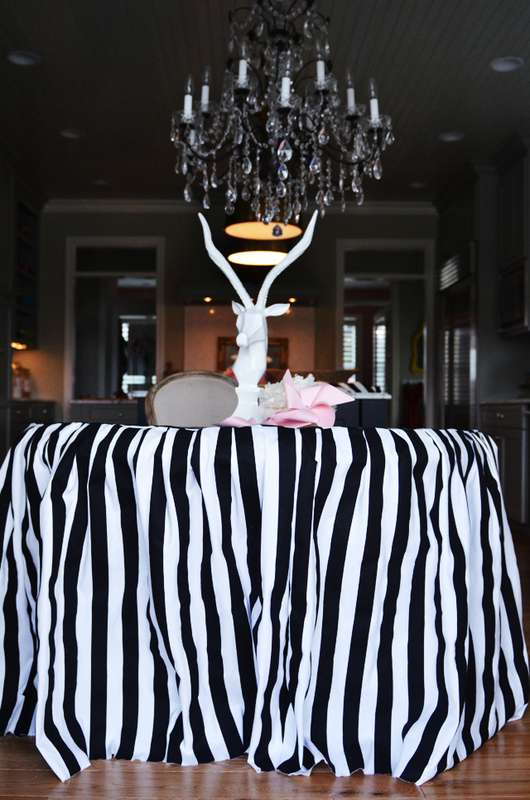 i’ve been wanting to share my love for the skirted tablecloth for a while but i know my unorthodox ways drive some folks crazy! That’s my kind of sewing too! Love it! I enjoyed this so much especially since my 4 year old granddaughter and I made her a “wedding dress” yesterday out of an old white lace bed skirt and a white tank top. I love creative sewing & duct tape. You are the best! now THAT sounds cool, Martha! 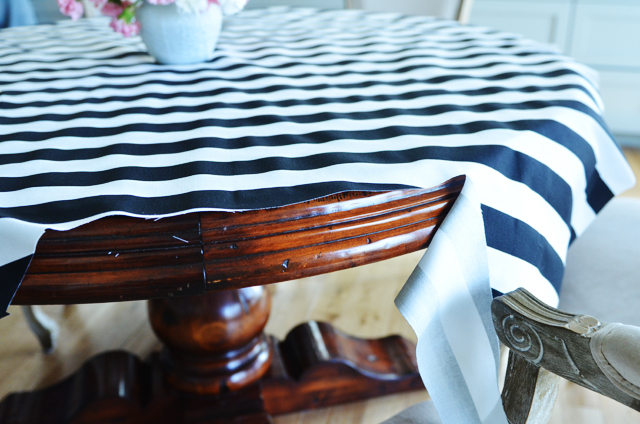 Un-hemmed tablecloth don’t bother me – I love sewing simply. But 2 things do bother me – first I hate eating at a table with a long tablecloth – maybe I’m just clumsy, but I end up with my legs and feet all twisted up in it, pulling it or my plate off. And second – I too love my wood table with its ironwood base. I would never want to cover it up. I guess I would only use a tablecloth if my table was ugly. 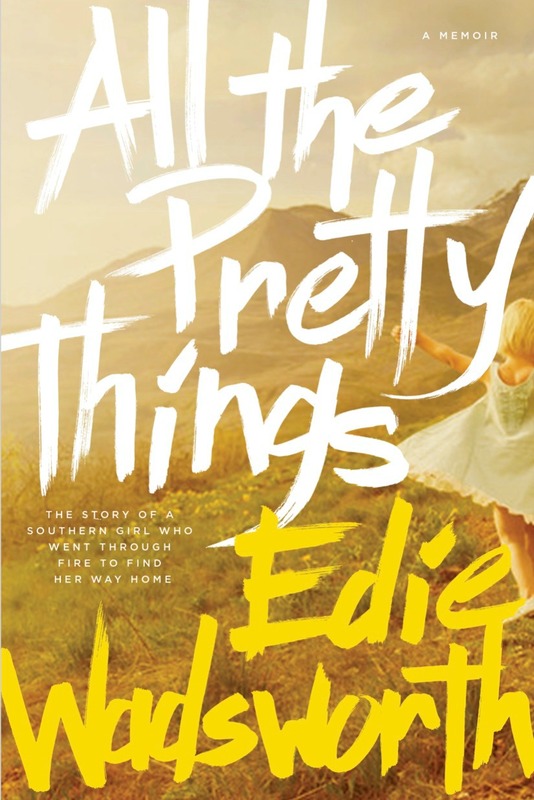 But you dear Edie – I love – wish you could be my neighbor – I would pick your brain about soooo much – and then go line dancing with you. and YES, to the neighbor and line-dancing!! Hey there! Love this skirt. Made one a few weeks ago by tying strips of tulle to a ribbon. It was divine, simply divine. I wanted to wear it rather than pin it around a table. Wish we were neighbors, your girls could come paint in our schoolroom, and I would send mine over to yours to learn to cook. Love ya. i wish we were neighbors, too, miss amy!! Girl, this is the tutorial that will actually get me to drag my sewing machine out of the attic. I’ve been using one of those folding buffet tables as a desk in my craft room (aka “crap room”) and it’s 9 kinds of ugly. 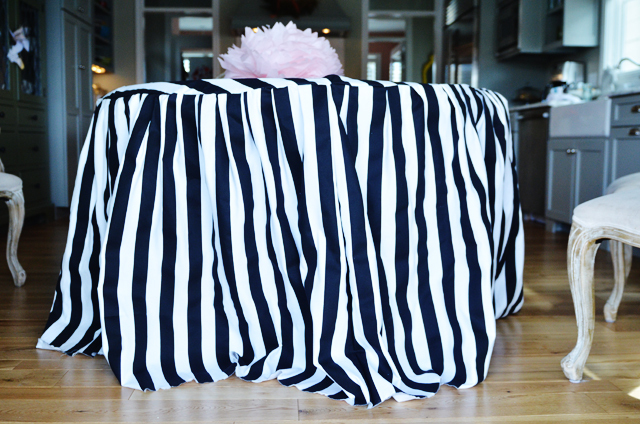 I’ve wanted a skirted tablecloth for-evah, but couldn’t stand the idea of forking out so much money just so I can have a place to hide stuff underneath! But this . . . .this project I can get behind! Yee haw! I am now convinced, I need a chandelier. love the party idea. robin (you met her at Pearls and Grace Event at Opryland) did her daughter’s birthday with the theme “Paisley’s Parlor” which all began with her curls, and silhouette. darling, I tell ya, darling. please please post pictures of your party! I’ll be sure to bookmark it and return to read more of your useful information. Thanks for the post. I will definitely comeback. 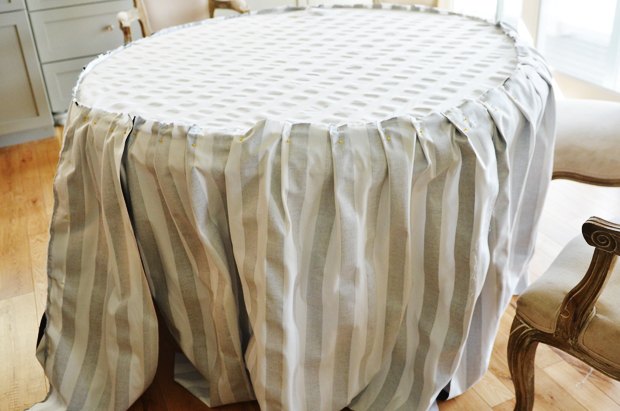 This is some really good information about how to make a skirted tablecloth. It does seem like a good thing idea to lay the fabric on your table. It might make measuring things a lot easier. I wonder if you can get premade tablecloths like this.